Like Edward Hopper, who used the rocky coast of Maine and sunlit buildings of Cape Cod as artistic inspiration during his lifetime, I married into a family that has strong ice cream allegiances in both locales. Unlike Hopper, who essentially abandoned Maine in favor of Cape Cod after 1929—returning for only one brief visit before his death in 1967—I’d never be able to give up one in favor of the other. Even Hopper’s dour disposition might have been improved by a scoop of Round Top ice cream in Damariscotta, Maine, which he’d have been able to sample since 1924, and Four Seas in Centerville, which he might have passed by each summer since 1934. Both stands serve extra creamy custards with a silky, gelato-like texture that walk a fine line between hard scoops and swirly soft serve. The gals and guys working each counter have no choice but to push and mold the ice cream into its cone or cup rather than scoop it into a perfectly portioned circle, and they’ll start to melt immediately upon leaving the freezer. 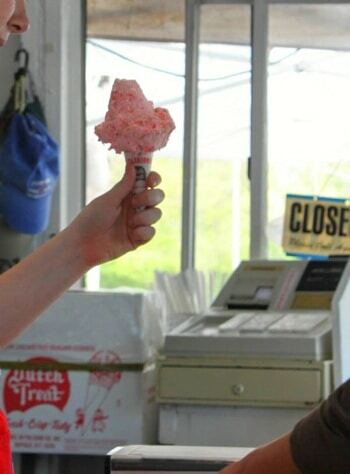 Four Seas is slightly airier, with an almost-whipped consistency, while Round Top’s denser ice cream buys you an extra 30 seconds before milky rivulets start to snake their way down your arm. From its simple neon sign to the irresistibly swiveling stools at the small counter, Four Seas (360 South Main St., Centerville) plays up its small-town New England charm. A small diner-style restaurant is nestled to the left of the entrance, should you feel the need to preface your ice cream with a grilled cheese. 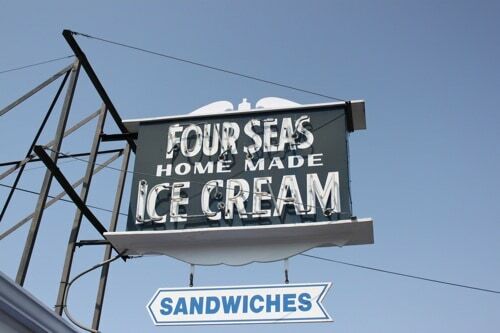 Four Seas has 24 flavors constantly “on tap,” though you’ll always be able to find your signature flavor packed in a to-go pint if it’s not available in a cup or cone. For Memorial Day weekends in Hyannis, it’s tradition to make a Four Seas run and stock the house freezer with quarts of peppermint stick, chocolate, coconut, butter pecan, and chocolate chip—though I’ve just started bucking the trend and requesting a kid-size lemon crisp cone of my very own as a bonus. Fans of spumoni, that Italian frozen confection with candied nuts and fruit, should order a scoop of Four Seas frozen pudding as a worthy New England substitute. 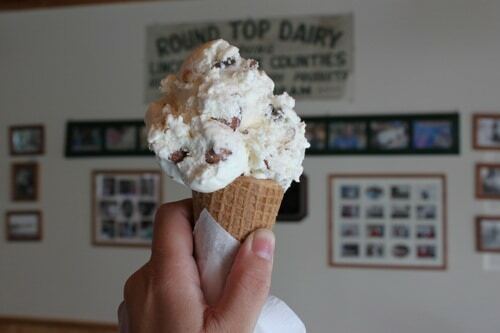 On another Main Street about 200 miles away, Round Top (526 Main St., Damariscotta) boasts 40-plus options, including a variation on Maine’s ubiquitous Moose Tracks flavor called Eagle Tracks, chunked out with Oreos and Reese’s peanut butter cups in vanilla ice cream. You’ll find Round Top at a few other local Maine icons like Moody’s Diner in Waldoboro and Red’s Eats in Wiscasset, but to get the full range of flavors, the no-frills shop is the only place to go. There’s no neon here, no full menu of savories, just a whole lot of ice cream to choose from. On sunny afternoons, you can slurp al fresco on a back porch that overlooks green pastures so photo-ready as to be a cliché. On rainy days, just stand at the glass door and look out onto the fields. A word of warning that one cone might not be enough—with honest-to-god real berries in the strawberry ice cream and coconut flecks and full-size roasted almonds in my usual order, Almond Joy, sometimes it’s too hard to narrow it down. Stick with the small size and you might have enough room in your belly to try a second flavor. Or grab a pre-packed flavor from the cooler and bring it home for later. There’s a cheap and easy way around picking a winner between Four Seas and Round Top, and it’s the way I’ve wiggled out of many a hotly contested debate at the dinner table: choose a favorite flavor from each place and don’t let them overlap. 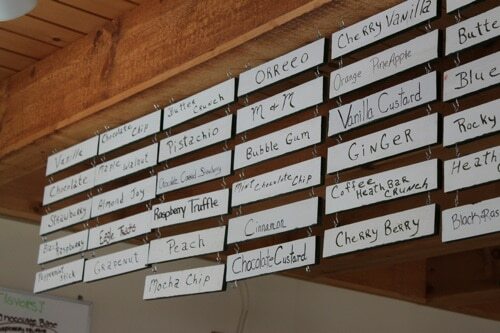 That’s why lemon crisp is my dish on Cape Cod, and Almond Joy is my signature cone in Maine. Nary the twain shall meet. When pushed, I’ll admit that overall I prefer a denser, firmer ice cream like Round Top’s, but a long Cape weekend without an oozing, melting pint of Four Seas peppermint stick would be a hollow vacation indeed. And come on, it’s ice cream and it’s just plain good. There’s no granular texture, no ice chunks, no skimping on the flavors or ingredients at these two shops. When the quality bar is set this high, why restrict yourself? Don’t choose. Eat them both.